This watercolour is of the remains of a once magnificent Elizabethan mansion. 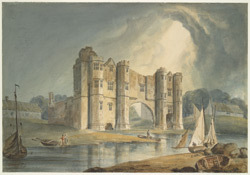 Torksey castle still stands, precariously, on the east bank of the Trent river in Linconshire. It was once home to the Jermyn family and later became a stronghold for the Parliamentarians during the civil war, being attacked and virtually destroyed in 1645. An imposing structure of limestone and brick, Torksey was built on the site of a Norman motte and bailey.